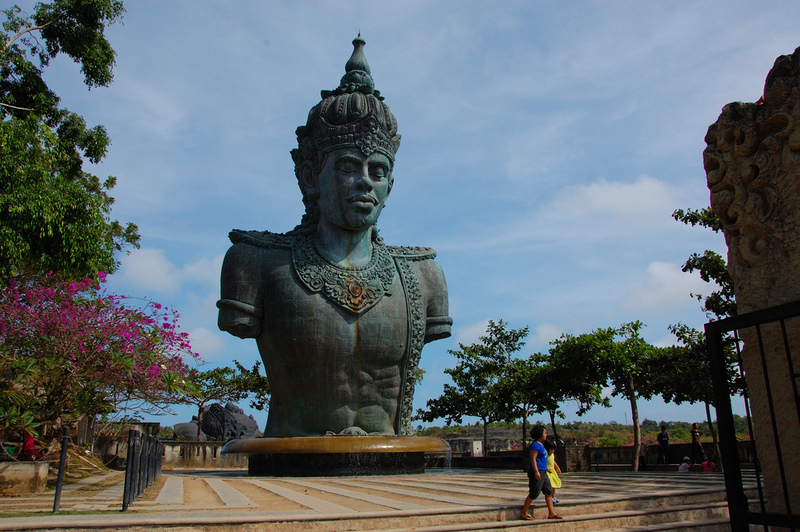 Designed and built by Nyoman Nuarta, one of indonesia’s foremost modern sculpture, The Garuda Wisnu Kencana Statue or GWK and its pedestal building will be standing 150 maters tall with its wings span 64 meters across. Made form more than 4000 tons of copper and brass, the statue is picturing Lord Wisnu, as the source of wisdom, ridding on the back of mystical bird Garuda as the manifestation of conscience toward Amerta, the perrenial goodness. The statue and its pedestal will surrounded by more than 240 hectares cultural park which was once an abandoned and unproductive limestone quarry. The culturl park will provide attractions for both local and foreign visitor with supporting facilities such as Lotus Pond,festival park,Amphitheater,Street Theater,Exhibition Hall, as well as Jendela Bali the Panoramic Resto and Souvenir shop. At present time, the statue of Wisnu,the statue of Garuda, and the hands of Wisnu has been placed temporary in three different plaza within the pak. GWK cultural park is intended to educate, specially the young generation about the importance of preserving and cultivating world’s cultural heritage.